I want to apologise for not posting this week- I was in Sweden and forgot to organise cover. Whilst I was in Sweden though I saw this ship, pictured here. It is the Vasa, launched in 1628, it sank 20 minutes later on its maiden voyage carrying Swedish troops and sailors across to Poland in order to fight in the 30 years war. 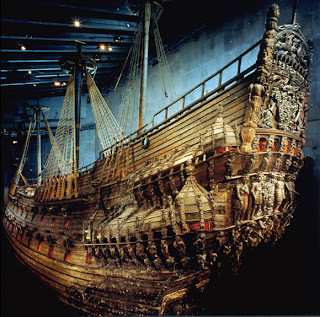 It was recovered later from the sea bed and is now part of a museum in Stockholm. It is a beautiful ship- but completely impractical, sitting very high out of the water and yet being very narrow, it was always vulnerable to the movement of the seas and to a gust of wind. What though it also symbolises in some ways is the emense power of early modern monarchy: Gustavus Adolphus built the ship as a direct rebuke and challenge to his kinsman Sigismund King of Poland and the ship's motifs and symbolism reflects that. You could portray it simplistically, as our tour guide did, as a massive display of one up man ship on behalf of one member of a family against another- of course it is not and the thirty years war was about much more than the fortunes of the Vasa House (the correct way to worship the Christian God for a start) but one of the powerful motivations behind the war was the amour propre of monarchs. The Vasa stands as a massive engineering monument but also a monument to folly. Read Gustavus for Ozymandias, and make the monument a ship and the poem is entirely apt!